Edited 22 May, because of feedback that the second chart was difficult to understand. There is a lot of noise about a so-called shortage of properties in Auckland. �An often quoted number of 30,000 homes for which I cannot find a source. �If there is a shortage of homes then demand must exceed supply, but how do you measure that? �I suspect a lot of the so-called analysis is assuming that all new immigrants arrive in Auckland and stay there. � Assuming that every new household has 2.5 persons is also likely to be just wrong. �What can be measured is the number of listings for rentals, which is the same as it has been for 8 years,�i.e. demand is not high, rental prices are not rising fast, so how can investors driving price be related to supply? 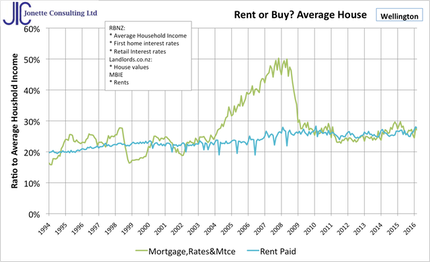 I thought of doing a simple bit of analysis, find out how rents, savings interest and mortgage rates interact. �The result is interesting. �My interest is in Wellington where there is a new price surge happening - is this due to a shortage of homes? �To make the comparisons simple to understand, I divide everything by average household income at the time of each comparison, this also removes inflation. While it was a lot better to rent than buy in the high price growth period of 2004 to 2009, it has been equal since then. �I guess a well know economist who used to live in Wellington and stills says rent is the best just missed out. �The reason it was better to rent was simply interest rates�kept the cost of borrowing $500k well above the cost of renting a $500k home. �Current ~4% interest rates means that it does not pay to rent or buy in the short term. Yes Homes AND rentals are becoming less affordable, rising from 20% of�household income in 1994 to 26% now. �I�suspect these are better homes due to new regulations , especially the raft of new ones that cam between 2005 and 2008 - you can even see the impact on rising rental prices. Invest in Bonds or Homes as an Investor? 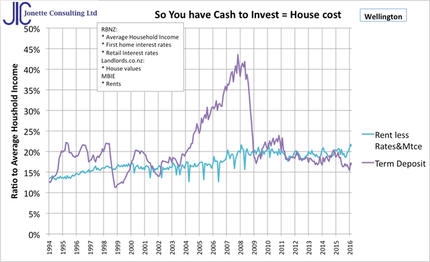 How about we look at similar data, also normalised to household income, but from the point of view of an investor. �Lets say you have the $500,000 funds to either invest in a home or to put the money in interest earning bonds, which is the better investment? Buy a Rental or Deposit in the Bank Options? During the boom, it was clearly best to invest in the bank on a day-today basis (ignoring capital gains), but usually it has made little difference, especially since the GFC. An interesting, and related issue is the continuing increase in rental prices as a proportion of household income, 16% to 20% over 2002 to 2009. �Is this due to the increasing quality of homes forced by new regulations? � It certainly matches the period of quality changes from 2005 to 2008 when a lot of rules on insulation and wind strengthening were introduced. �Note there does not appear to be any relationship to immigration!